The Index opened positive but saw some profit booking to touch the lows of 8315 only to see the responsive buyer back in action to take the index back in green and closed at 8360.55, gain of 32.00 points. The broader market was also positive, with 787 advances to 693 declines. 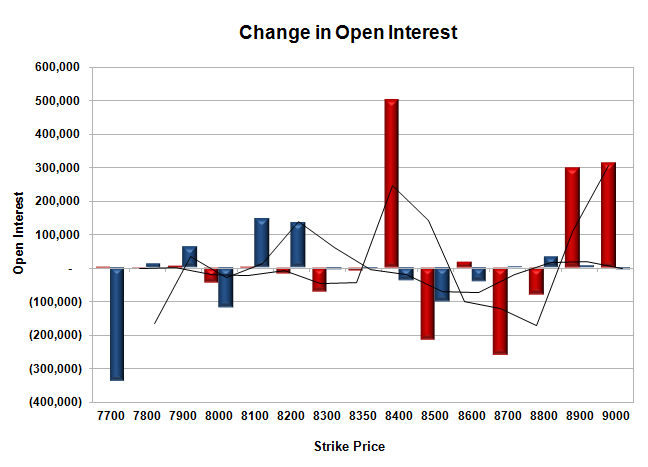 The range as per OI table comes to 7900-8600. 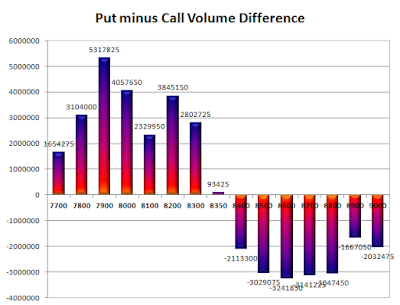 Call option 8400, 8900 added 8.02 lacs OI with profit booking seen at 8500 and above strike prices. Put option 8200-8100 added 2.79 lacs OI with profit booking seen at 8500 and above strike price. 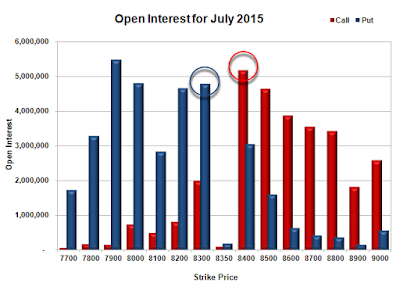 Nifty Open Interest is at 1,83,08,525 up by 4,39,300, with increase in price, most probably huge long build-up. Bank Nifty Open Interest is at 16,74,750 up by 61,900, with increase in price, most probably long build-up. FII’s sold 0.62 lacs Futures, which includes 2054 contracts long build-up and 4531 contracts short build-up, with increase in net OI by 6585 contracts (includes 42318 longs to 44795 shorts for the day) and the Average Price comes to 8542.68. FII’s Index future open contract as on date is 508904 Longs to 224832 Shorts, Net Long 284072 contracts. 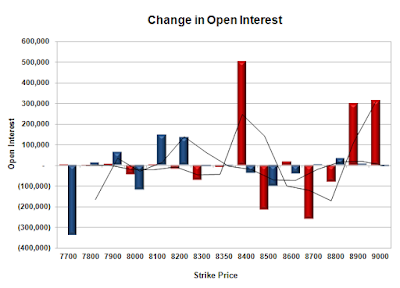 Initial support at 8300, with OI of 47.93 lacs and below that at 8200 with OI of 46.65 lacs. Initial and best resistance at 8400, with OI of 51.69 lacs and above that at 8500 with OI of 46.37 lacs. Day Range as per Option Table is 8283 - 8424 and as per VIX is 8286 - 8435 with 8351 as the Pivot.